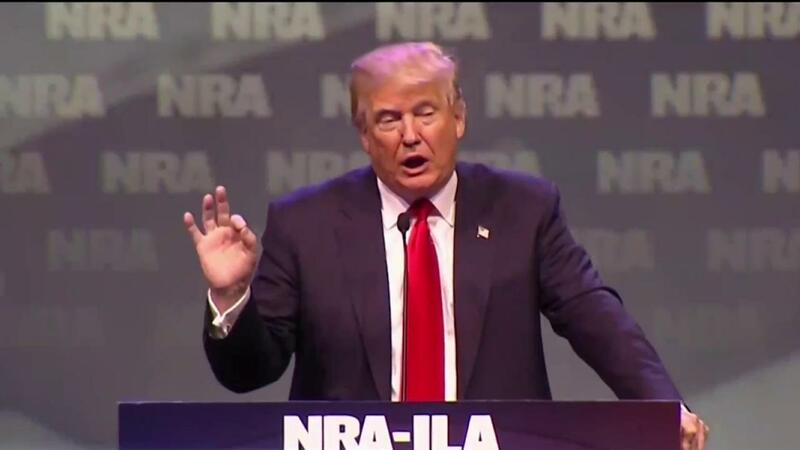 Trump during an address at the NRA's annual convention Friday said Clinton wanted to "abolish" the Second Amendment and called her the "most anti-gun ... candidate ever to run for office." 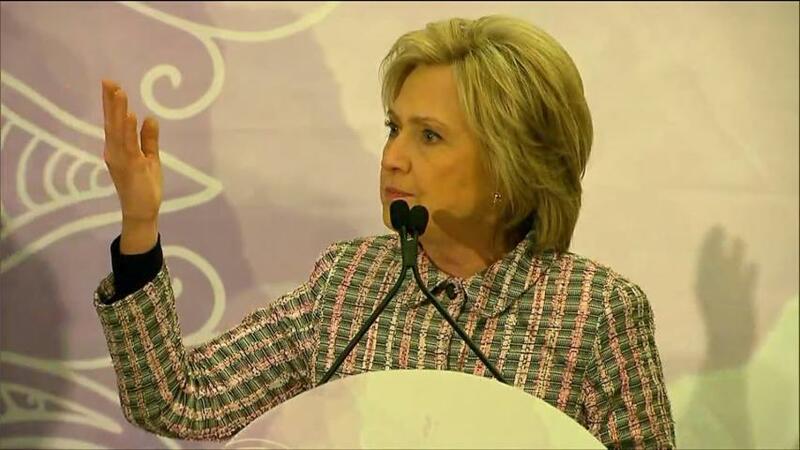 Clinton has not called for overturning the Second Amendment, but has called for gun restrictions. The Clinton campaign responded to the claim by accusing Trump of "peddling falsehoods" and "conspiracy theories." During her speech Saturday, Clinton said the country must take action to end gun violence in America. "At long last, we must do something about the gun violence that stalks communities and terrorizes families. And this is on the minds of every one of us here tonight, as we remember all of the young people who have been lost," Clinton said. "This problem isn't going away." Clinton has made what she calls common sense gun reforms a central part of her campaign, and has used the issue to differentiate herself from rival Bernie Sanders, who voted for a law that shields firearms manufacturers from some lawsuits. Before her remarks, Clinton met backstage with 60 of the "mothers of the movement," or women who have lost their children to gun violence or police incidents. Aides said a few of the women brought up Trump in conversation with Clinton, citing concerns. Clinton, who has campaigned with several of the mothers, received a letter from each woman, an effort coordinated by Fulton. "They handed me that letter and I'm going to read every single word of those letters because each of the mothers is telling us something that we all need to hear — not just about their tragedies but about our country," Clinton said. Fulton started the foundation in her son's name after he was fatally shot by George Zimmerman in 2012, in a shooting that touched off an intense national debate about race, guns and self-defense. Fulton endorsed Clinton earlier this year and has campaigned with her several times since. "The reason why I stand with her is because she first stood for me. Not only did she stand for me but she stood for the mothers as well. Not one single candidate was talking about senseless gun violence" before they met, Fulton said as she introduced Clinton Saturday night. "The sisterhood that is here is so overwhelming in its love and I'm grateful to see all of you and it in action," Clinton said, praising the women for turning their "grief into action."